Fred Lee is not afraid to put himself out there. Lee is a radiologist at the University of Wisconsin Hospital and Clinics, where his primary area of interest is the ablation, or elimination, of cancerous tumors. He says that around the year 2000, he decided that the radio frequency ablation devices he and his colleagues were using “were just not good enough.” But since Lee’s background wasn’t in engineering, he had to reach out for help. After a few unsuccessful pitches to researchers, Lee got a bite from John Webster, a professor emeritus of biomedical engineering at the school. Webster found a graduate student named Dieter Haemmerich who was willing to assist Lee, and together the two built the device Lee envisioned. They later licensed the technology to Valleylab, now a brand of Medtronic (NYSE: MDT), the Ireland-based medtech giant whose products include radio frequency ablation systems. That example highlights Lee’s talent for spotting knowledge gaps (even his own) and finding the person or persons that can fill them. In addition to his clinical practice, research, and teaching duties at the university, he is the co-founder of three Madison-based companies—Cellectar Biosciences (NASDAQ: CLRB), NeuWave Medical, and Elucent Medical—and says he still works closely with the latter two. All three businesses involve technologies aimed at improving cancer treatments, but the similarities pretty much end there. The fact that Lee helped get such a diverse set of companies off the ground speaks to his ability to identify specific pain points experienced by clinicians, then assemble teams to engineer and commercialize technologies that address these problems. Looking back on the fate of the radio frequency ablation technology he helped develop, Lee says that “Valleylab did an incredible job of bringing it to market.” But at the same time, he says that he and Haemmerich believed Valleylab could have done more to advance and promote the technology. Haemmerich went on to earn his PhD from UW-Madison in 2002, and is now part of the faculty at the Medical University of South Carolina. At his thesis defense, which Lee attended, another chance encounter with an engineering professor, Daniel van der Weide, planted the seed that would grow into NeuWave. 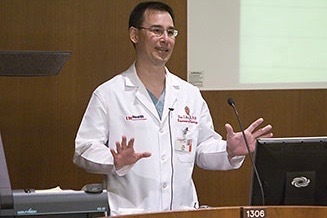 According to Lee, Haemmerich was repeatedly interrupted during his presentation by van der Weide, who said the ablation device Haemmerich was describing would work better if it used microwaves instead of radio waves. Van der Weide identified himself as a UW-Madison professor of electrical engineering with an interest in sensing and communications, and told Lee that microwaves might simply be the best design for that particular application. Lee was intrigued, though not yet persuaded. He retrieved a particular-sized spinal needle, at van der Weide’s request, and then the engineer got to work. That same day, van der Weide used the needle, a coaxial cable, and a power supply from his lab to build an ablation device that was superior to the one Lee and Haemmerich had constructed and licensed to Valleylab, Lee says. “I’m like, ‘Holy cow, that is unbelievable. We really have something here,’” Lee says. From there, van der Weide brought his concept into Lee’s research lab, and they recruited two graduate students—Chris Brace and Paul Laeseke—to develop it further. The four of them later founded NeuWave Medical (initially known as Micrablate); they completed the required paperwork on a dining room table at Lee’s home. Brace, who has since become an associate professor of radiology and biomedical engineering at UW-Madison, now runs what had been Lee’s lab, under the name BraceGroup. Laeseke went on to Stanford University to train as a resident physician in radiology. Both men continue to be involved with NeuWave. A few years after its founding, NeuWave itself needed to raise money to help it commercialize a device that could help doctors perform microwave ablation procedures. Madison-based Venture Investors was evaluating the startup, Lee says, and brought in Laura King to help with the due diligence the fund performs on prospects. King had a couple decades of experience in the medical devices industry at GE Healthcare. King got that opportunity, joining NeuWave as president and CEO in 2007. She put together a team of engineers, including Rick Schefelker, another veteran of GE Healthcare, Lee says. All of the members of that early engineering team remain with NeuWave today, he says. Another key contributor was Lisa Sampson, who helped with user interface design and now works in the lab Brace runs. The Certus 140 includes probes whose tips deliver energy to soft-tissue lesions, as well as a wheeled workstation with a touch-screen monitor. Lee says NeuWave “was funded around 2008,” built a machine and got FDA approval for it, then began selling it by 2011. It was an “incredibly fast” timeline relative to some of the company’s larger competitors, he says. King left NeuWave in 2013, according to her LinkedIn profile, and the company later named Dan Sullivan its president and CEO. In March, NeuWave announced it had been acquired by Ethicon, a surgery-focused subsidiary of Johnson & Johnson (NYSE: JNJ), for an undisclosed amount. From inception to exit, “NeuWave is just a great story for the university,” says Carrie Thome, director of investments at the Wisconsin Alumni Research Foundation (WARF), the UW-Madison’s technology transfer arm. WARF helped NeuWave patent certain aspects of its technology early on, and also invested in the company. Perhaps that will turn out to be Elucent Medical, Lee’s latest startup, and another company in WARF’s investment portfolio. Elucent, which won the grand prize in the 2014 Wisconsin Governor’s Business Plan Contest, is seeking to commercialize a biocompatible wireless “tag” that would be implanted in breast cancer patients and used to monitor their tumors. The technology could make treatment less costly and invasive, Elucent says. Elucent’s list of co-founders includes several current or former leaders at NeuWave: Lee, van der Weide, Brace, and King. Other Elucent co-founders include Lee Wilke, a surgeon and director of the UW Breast Center, and Elizabeth Burnside, a radiology professor whom Lee calls “one of the premier researchers in breast imaging” at UW Health. Currently, after a breast cancer patient has a biopsy, a clinician inserts a small metal clip into the patient to mark the location of the biopsy, Lee says. In some cases, the results of the biopsy indicate that a tumor is cancerous and the patient needs to undergo surgery or another procedure. When this happens, the surgeon needs to know what part—and how much—of the breast should be removed. On the day of surgery, this information usually comes from someone like Burnside, after she has reviewed mammography scans. Using the metal clip as a target, Burnside would insert a “hook wire” into the patient, so that the surgeon knows where to cut. Lee says that Elucent’s tag would eliminate the need for hook wires. It would also cut down on the number of procedures for breast cancer patients, since the tag would be inserted at the time of a biopsy (replacing the metal clip). Elucent’s device is designed to use a resonator coil to emit a small pulse, which can then be detected by certain surgical instruments. “It’s like ringing a bell,” Lee says. In 2014, King told Xconomy that Elucent planned to file for FDA approval in 2015 and start selling its device this year. Lee says the timeline has been pushed back, and the startup is currently focused on design features related to the device.